Our information theory considers that “there is a Turing tape inside every single cell of a Turing tape”, this new tape now fails to become a Turing tape (popularly people would love to call it Fractal but there is no guaranteed self-similarity, it is Numtal!!!). To operate this tape now we need time cycles nested with each other. When we created this nested time cycles, we did not think about it much. Our only objective was to solve the immediate crisis. Since we have a singularity we need a tool to penetrate deep insight and harness an insight from within. So, the new Fractal tape uses a basic information processing unit, three-time cycles connected to each other, one that represents Turing tape inside a cell, one that represents the Turing tape above where the cell exists and third, the third unwanted Turing tape or the third time cycle is that of an observer. We initially did not want to bring the third Turing tape, but you might have already noticed that we do not have any representative tape for the cell under consideration, therefore we need a new tape to project the possible cells states of the cell under consideration, that task is performed by the observers tape. So, we get a projected hyperspace, namely “reality sphere” that sphere is the only real thing in the information units time loop architecture. Now, a time loop has frequencies at certain time gaps to write geometric shapes, that is information content and all the three loops are imaginary, does not come from infinity but imaginary space. Now, above we described all that one needs to learn to understand the science behind our information processing unit, which eventually creates a resonance chain and morphs the events happening in nature. Mimicking the frequency space is amazing in the sense that suppose a protein is communicating with another protein, then if one images its shape its silent there is no movement. However, if we could somehow convert the information space into a shape changing material, then we could find a slowly shape changing material, and if we could enter inside the structure, then we would find some other structures are changing quite fast. If we could take one, and enter inside, we would find a large number of extremely fast shape changing materials. This journey would go on and on. Now, you learn all about the science of our information processing protocol. Lets discuss the philosophy of infinity. Gabriel’s paradox: Gabriel suggested a trumpet that looks like a cone but it goes thinner and thinner to infinity, it has infinite surface area, but when we try to paint it, we would require only a finite amount of paint, drop it from its mouth and it would pass through all the way. Dart on a dartboard: Suppose we have a pin, we throw it on the wall wherein a circle is drawn. What is the probability of touching a particular point, given that there is infinite number of points in that area? If the probability is zero, then, the total probability of hitting the entire circle anywhere is zero, but that cannot happen. We need to consider a very small area, to get out of infinity paradox. Hyper-webster is a hypothetical dictionary of infinite space of all possible letters. The idea is the same as numbers, it has 26 chapters of one letter each. Then each of these chapters have 23 paragraphs and so on. Now, if you go on dividing the possibilities are infinite. The exciting part begins now, suppose the first chapter of the dictionary has all possible words beginning with A, then if one removes A, the rest is same as all possible chapters with all possible words. In fact all 23 volumes are self-complete, if we print one of 23, we are done. Banach-Tarski This is very interesting now. We create the same dictionary on a sphere. One could write infinite words on the surface in the infinitely available paths on the spherical surface. Even if we start walking from any one point we could travel covering every single point on the spherical surface following , Up, Down, Right, Left, UR, RL, UL and DR. Now, if the lattice on the sphere could be a hexagonal or rectangular, with 6 and 8 neighbors respectively, we could have 3 and 4 equivalent roads respectively. There would always be two poles and hence, two identical spheres could be created just from one sphere if we decide to walk on the routes following a given protocol. Whenever there is a case of real number of points, by Banach-Tarski argument one could create 1=1+1, when the number of point is infinite. This violates the proof of Bertrand Russell. On the sphere we can start another journey. Either on the disc surface alone with 3 circles like the one below, or start with 4 spheres making a sphere Apollony fractal. In 3D one starts with 4 spheres each at the vertices of a tetrahedron. An outer imaginary sphere is the boundary cavity that encloses the 4 spheres. The gaps are filled by subsequent Soddy spheres thus forming a solid object (at infinity). The result is often called an Apollonian sphere packing. The fractal dimension of the 3D Apollonian has been calculated as 2.473946 [M. Borkovec, W. De Paris, and R. Peikert]. Kravchenko Alexei and Mekhontsev Dmitriy have found an attractor that creates the Apollony fractal, the source code in C is provided here: apollony.c. Tetragonal space is the starting point. What about other starting packing? The largest number of unit circles which can touch a given unit circle is six. For spheres, the maximum number is 12. Newton considered this question long before a proof was published in 1874. 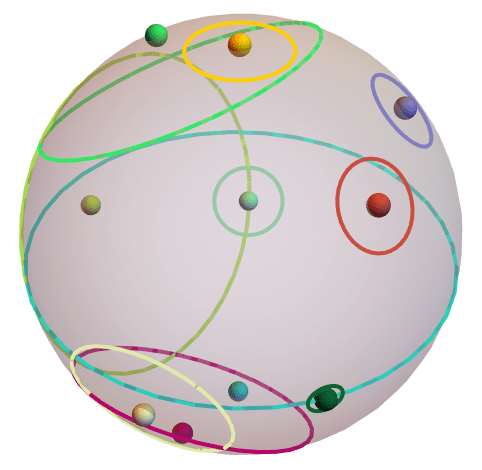 The maximum number of hyperspheres that can touch another in dimensions is the so-called kissing number. It is shown that optimality for sphere packing is n=4 The history of packing problem is here. One could have fun packing the area with circles here, how to draw these are sphere here. There are three imaginary worlds that constructs the fundamental unit of information for our structure. We see above that the three imaginary functions if they are different then they make an imaginary sphere. Though circle grows with three imaginary worlds, in the Appolony fractal, the sphere grows optimally with four spheres. For an external observer, a sphere always looks like as if it is made of three circles. This is how the apparent mismatch between the infinity spheres and circles are resolved. Change in the brain’s physical structure is fatal to our brain modeling. However, there are plenty of brain models that simplify the brain structure to make it easy to process. For example, conformal mapping of the brain is done on a sphere (M.K. Hurdal, P.L. Bowers, K. Stephenson, D.W.L. Sumners, K. Rehm, K. Schaper, D.A. Rottenberg, Quasi-conformally flat mapping the human cerebellum, in C. Taylor and A. Colchester (eds), Medical Image Computing and Computer-Assisted Intervention – MICCAI’99, Vol. 1679 of Lecture Notes in Computer Science, Springer, Berlin, pp. 279-286, 1999). The idea is similar to those who want to map brain in a hypothetical structure, but we do not. Our fractal information processing theory suggest assembling the time cycles on the sphere. Compared to Hurdal suggested conformal flattening we do not change the physical shape of the any part of the brain, for our theory, any change in the structure means change in the information content. We are bound keep its purity intact, and then integrate tiny pieces of information in it. Are we driven by madness? How come we could even think of processing information of the entire brain? Above we have discussed that a single sphere holds an infinite number of paths and we could make a singular mathematical structure of sphere inside representing the entire human brain. Now, the time cycles would be on top of its surface as shown below. Each of the circle with an independent center could represent the time cycle network representing various organs and their biological rhythms. Using such a sphere is beautiful because we get only one unified system to hold infinite possible time cycles. That is highly generous statement. One to one correspondance between the Gabriel’s paradox and renormalization: One to one correspondence between Gabriel’s paradox and nested time cycle synchronization that is designed to replace renormalization, the surface area of the cone is infinity, however, when we put paint to color it, the paint passes through the tunnel and it blocks at the point depending on the density of the paint. The paint for us is the observer’s nested time cycle. The resolution of the solution is always ultimate. One to one correspondance between the Banach-Tarski paradox and the measurement in a fractal information theory: Suppose we have a nested time cycle sphere, like the one shown here, the observer would also be a sphere, it would sync with the paths and generate the connected path and form a “reality sphere” just like the one here. Creation of an identical information replica is its greatness because the solution of a problem is an infinite space. One to one correspondance between the Hyper-webster dictionary and the generation of multiple spheres: If there are large number of observers, of course there are infinitely large number of observers, therefore large number of “reality spheres” will be produced and those would merge just like the Hyper-websters dictionary. All these spheres are distinctly produce, yet they create a singular identity. Imagine thousands of “reality spheres” being produced and all of them simultaneously hold the solution. ← Why do we need a global database of biological rhythms?